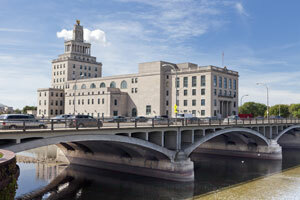 Cedar Rapids is home to over 100,000 residents and is nicknamed the “City of Five Seasons”. There are many effective advertising opportunities throughout the city including billboards in neighborhoods such as Czech Village and Wellington Heights. Target your audience with out-of-home advertisements near cultural hot spots like the Paramount Theatre and the Cedar Rapids Museum of Art. The major highways servicing the city can also provide billboard and other outdoor advertisement possibilities. Billboards on I-380, US 30, or US 151 would generate high traffic exposure of your business.